Last week I reminded readers that an oxalic acid dribble was a viable alternative to vaporization. I also said that, personally, I was unwilling to purchase and store all the paraphernalia that is required, such as the vaporizer, 12-volt battery, and respirator. After all, I keep a small apiary that never exceeds 15 hives. For me, the dribble method is fast, easy, economical, and effective. However, after a series of communications from various readers, something occurred to me. Many of the people who purchased the equipment were defending their choice by saying it would last a long time, and in any case, now they had everything they needed for reliable mite treatment and they wouldn’t have to purchase anything else. That’s when it hit me: Many of those people have no intention of using anything but their vaporizer for Varroa control. Mites can be checked off the list. Problem solved. What some beekeepers are forgetting is that oxalic acid, no matter how it is applied, needs to be rotated with other mite control products. This simple step is the only thing that can delay the inevitable resistance that mites will develop to oxalic acid or any other product. Living things vary in their ability to develop resistance to chemicals, diseases, and environmental conditions. Some, like cockroaches and mosquitoes seem to evolve overnight, and the pesticides that worked wonders last year won’t touch them this year. Other species—and honey bees are a good example—change much more slowly. The speed and efficiency of these changes is genetically controlled, and it is the same basic phenomenon that gives us antibiotic-resistant diseases such as MRSA. From what we’ve seen so far, Varroa mites are more like roaches than honey bees. One by one, they have become resistant to various chemical controls, and resistance to the newest treatments will come in time. Oxalic acid is no exception. After a treatment of nearly any poisonous substance, a few survivors remain. These resistant survivors reproduce and raise resistant or partially-resistant offspring. After a few more treatments of the same substance and and few more generations, all the offspring will be resistant to that substance. Only by killing those resistant individuals with other chemicals can we break the chain of resistance. Simply put, to preserve the ability of pesticides to work in the future, they have to be alternated today. RESISTANCE MANAGEMENT: Oxalic acid’s mechanism of action is unknown at this time. Any Varroa mite population has the potential to become resistant to acaricides. Resistance development is affected by both the frequency of application and rate/dose of application. Continued reliance on a single class of miticide or single miticide with the same mode of action will select for resistant individuals which may dominate the mite population in subsequent generations. In order to prevent resistance development and to maintain the usefulness of individual insecticides it is important to adopt appropriate resistant management strategies. When possible, rotate the use of miticides to reduce selection pressure as compared to repeatedly using the same product, mode or action or chemical class. If multiple applications are required, use a different mode of action each time before returning to a previously-used one. Base miticide use on Integrated Pest Management (IPM). This includes proper pest identification, monitoring for locality specific economic threshold and economic injury levels, record keeping, and utilizing all available control practices (cultural, biological and chemical). Maximize efficacy by following all label instructions including dosage and timing of application. No one even knows for sure what the mode of action of OA is against varroa, nor how it is absorbed. And no matter, I can assure you that some mites will be more resistant than others, which implies that some degree of resistance is possible. Remember, there is only a small margin of safety between the dose that kills mites, and the dose that kills bees. That means that varroa only needs to develop a slight degree of resistance until OA is as toxic to the bees as it is to the mites. Rotate treatments! In other words, as mites becomes resistant to oxalic acid, we cannot simply apply greater and greater dosages. If we do, we will soon reach the dosage that takes down the bees as well as the mites. Both the EPA and Randy mention the mode of action as being a factor in determining chemical rotations. According to Wikipedia, “A mode of action describes a functional or anatomical change, at the cellular level, resulting from the exposure of a living organism to a substance.” So basically, the mode of action is the way in which a chemical pesticide kills the mite. The directive in the EPA label is to rotate between pesticides that have different modes of action. When I read this, I immediately wondered how a typical beekeeper, myself included, could easily identify the mode of action of any particular substance. I passed this question on to Randy. Although he didn’t elaborate, I gathered from his answer that he favors alternating those that are organic acids with those that are not. So even if we don’t know for sure the modes of action for any particular substance, we can assume that acids behave similarly to each other, as do members of other groups, such as the phenols. For example, oxalic acid and formic acid are both acids so we can assume they behave similarly in the cell. Perhaps the same is true for hop beta acids, but little is known. There may indeed be additional modes of action within these substances but, at present, we don’t know that either. Thymol, on the other hand, is not an acid but a phenol. So in Randy’s practice, he alternates between oxalic acid and a thymol-based product. He also suggested one could use Apivar (a synthetic miticide) as a third alternative if he or she were not opposed to such products. Randy’s take on this makes eminently good sense, and I was dumbstruck to learn that I was doing it wrong. All along I’ve been meticulously alternating between different products, but they were products with the same (as far as we know) mode of action. I urge all of you to take the subject of mite resistance seriously and never use the same treatment two times in a row. If you treat twice a year, for example, you need to use two different treatments having two different modes of action. It is fine to use your vaporizer as long as you alternate its use with another product. An oxalic acid vaporizer is the “gotta have it” piece of equipment right now. But if beekeepers begin using it for every consecutive treatment, it won’t be long before it becomes as useless as a tanging pan. The above analysis is based on my own interpretation of the official EPA label and Randy’s reporting at ScientificBeekeeping.com. At the very least, everyone who uses oxalic acid in a beehive should be thoroughly familiar with the official label. In addition, a careful study of Randy’s work will clarify most oxalic acid questions. Please take the time to read both. A wide-tooth shearing comb can be used to check drone brood for mites. Courtesy of Maggie Shanahan. Thanks for the info, Rusty. Helpful as always. The photo of the wide-tooth shearing comb is intriguing. Could you elaborate on how to use that tool? Do you just stick it in and skewer drones and pull them out? The photo was taken by a friend while she was working bees in New Zealand. I think lots of folks have shearing combs down there, due to all the sheep! She didn’t say, but I think they just raked it over the drone comb. I will ask her, if I can figure out where she is. Or maybe one of my New Zealand readers can explain . . .
You can also use a honey uncapping tool to rake through drone brood and check for mites. Rusty, what is the research out of Europe on mite resistance to OA? They’ve been using it a lot longer than we have here in the US, so I would think there would be data available. I haven’t heard, but perhaps some of my UK readers would like to comment. Emily? Are you out there? That said, a lot of beekeepers stateside have been using it for years without official approval. Personally, I haven’t heard of resistance yet, but if it gets abused, it will happen faster. I don’t know about Europe in general, but in the UK our bee inspectors advise alternating treatments and using a range of treatments during the year. They recommend using oxalic acid when hives are broodless only (research from the University of Sussex LASI centre has confirmed that this is most effective), which would usually mean one application only during December or January. Then treatments like a thymol or formic acid based one could then be used in the summer, plus ideally non-chemical husbandry methods like a shook swarming, comb trapping or drone brood removal. See the National Bee Unit’s leaflet Managing Varroa for info on this – http://www.nationalbeeunit.com/downloadDocument.cfm?id=16 – they have a section on resistance but it mainly talks about pyrthethroids, to be honest I haven’t heard much about oxalic acid resistance, perhaps because it isn’t often used several times annually here. Excellent advice!!! I over the years have always used what I called a “Cocktail”. After supers are removed, I hit the hives with the vaporizer. 2-3 weeks later, I’ll put in the Apivar strips and leave for the prescribed time in hopes that stragglers and newborn are treated into late fall. By then, (frost) mite population in the wild and my hives are practically non existent. Late fall until late winter I leave Apistan in the brood chambers until it’s warm enough to do a rotation (usually February or early March, but way before the flow begins). The thermal pictures I had sent you early this year were the late winter early spring buildup. True to the fact, anything can and will build up a tolerance to meds. After the honey harvest I’ve started mite treatment by using a thyme based treatment available here in the Netherlands called Apiguard. It consists of a gel. The bees will try to remove the gel and spread it through the hive. It takes 2 weeks for the first pack, followed by another 3 weeks for the second pack. In winter I use oxalic acid by dripping about 5 cc per row of bees. I’ve used this scheme now for three years. The mite count in my hives is very low. It’s an easy to use product that is save for bees and beekeepers. YouTube has several video’s showing how to use it: http://m.youtube.com/watch?v=3RGSp3VEeAg. We too have Apiguard, which works fine. Since it is based on thymol it works well in a rotation with oxalic. The equipment needed for the oxalic acid treatment is a sugar based solution of oxalic acid (600 grams of sugar, 600 ml of demineralized water and 35 grams of oxalic acid (crystals), a large syringe, gloves and common sense. The following (German) video showing the winter treatment for varroa: https://www.youtube.com/watch?v=zLmjGHbo-kg. I believe that is exactly what I’ve stated here: How to apply an oxalic acid dribble. 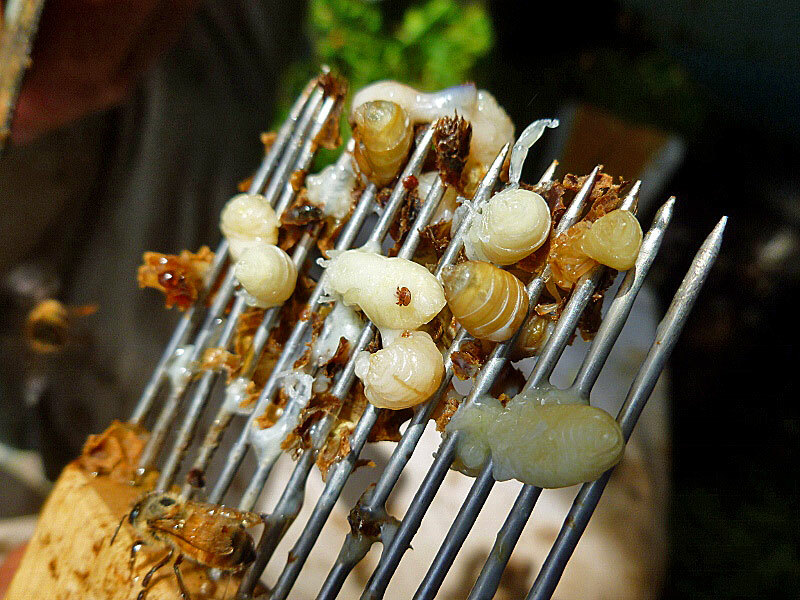 We use an uncapping fork instead of a sheep shearing comb to check drone larvae for mites. Slide the teeth under the drone cappings until you reach the hilt of the comb and then slowly pull/rock upwards and away with the end of the teeth coming out first. After examining the larvae for mites, I feed them to my chickens. Thank you for your immensely useful and informative blog on mite resistance. I have been keeping bees here in Central Italy for the last 6-7 years with varying success. Climate change has made a big impact. This year we had a hot March followed by a wet April and May which caused multiple swarming. In previous years I have used Apistan in September followed by the dribble method of Oxalic Acid but was hit by numerous CCD episodes. Now I read that Apistan could have contributed to CCD. Last year I switched to ApiVar followed by Oxalic Acid in December and suffered no losses. Very interested to read of the need to combine soft methods with hard. My experience seems to bear this out. Thanks again. Your blogs are so helpful. Until the mode of action of OA is determined, resistance is nothing more than conjecture. It would be like mammals becoming resistant to inhaling water. Eventually, it would happen, but is that timeline of concern? If I had to guess, I would expect to see pockets of resistance in three to five years in those places where oxalic acid is abused (not rotated) with other products. It could be longer. The timeline of concern is a relative thing. Why shouldn’t we do what we want and foist the problem on the next generation? Varroa Destructor was first discovered here in Norway in 1998. Since then, the only legal substance for treatment has been Oxalic Acid (and formic acid – but very few beekepers use that). Everybody uses the dribble method – once a year. No “miticides” are allowed. No “medicine” (antibiotics etc) is allowed. We have one of the healthiest bee populations in the world. Winter losses nationally are usually around 5%. In these climates (we have little or no brood in winter), it is the only way to go, and has been for almost 20 years. Excellent. I’m glad you wrote because this illustrates my point exactly. If we use these chemicals judiciously (and once a year is certainly judicious) we can go long periods without building resistance. But here in the US people are using three and sometimes four applications in as many weeks, which will build resistance at a much faster rate. Americans tend to believe that “if some is good, more is better” which is seldom true. It is not likely that mites will develop resistance to a naturally occurring compound such as formic or oxalic acid as these acids desiccate mites and it is difficult to see a resistance developed to this mode of action. Many thanks for all the help and info you provide!! In Randy Oliver’s PPP, slide #9, Randy has the oxalic acid content in various vegetables. What about adding some of these dried vegetables to your smoker? Would that be overkill or just a waste of time and energy? Lots of people have tried this, but the concentration is way too low. I used Apivar in the spring. I also used Apivar again in late summer. I just took my strips off after 42 days approx. 3 days ago. I did a mite count later via varroa board. I removed the board after 24 hrs. I still have over 30 mites on all but 1 of my 7 hives. The one hive only had 2 mites. This hive is also away from all the others.